The Raleigh/Durham/Chapel Hill, North Carolina area (aka The Triangle) is host to a wide variety of year-round songbirds—the cardinal, chickadee, titmouse, nuthatch, and goldfinch—all of which will continue to frequent our suet and seed feeders in winter. Doves and sparrows will patronize our ground seed, and insect-eating bluebirds, warblers, and wrens will stop by for suet as the insect population wanes. Beyond these year-round birds, there are a few intriguing migrant birds that, with some modification to our feeding practices, will seek refuge and energy in Triangle backyards this winter. 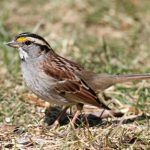 The white-throated sparrow migrates here in early October and stays through early May. Across males and females, this species has two plumage variations. Whether black or brown, both have white throats and bellies, gray breasts, white head stripes from forehead to crown, plus a yellow lore (front eyebrow), often duller in females. 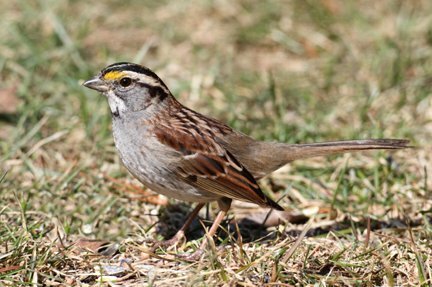 White-throated sparrows keep to the ground, often in flocks, scratching through leaves in search of seeds, fruits, and insects. Consequently, these visitors love leafy urban spaces with brushy edges or hedgerows and active bird feeders. How to encourage a visit: Add a sheltering brush pile if ample leafy groundcover does not exist. Use a ground feeder with millet and sunflower hearts. Scatter millet under brush from now until April for harsh weather energy and safe refuge. Keep your birdbaths thawed and full. As other Catharus family thrushes depart for winter, the hermit thrush joins us from Canada and northern US forests from mid October until late April. This bird has a rich brown top fading to a cinnamon red tail, a white belly and undertail, a brown spotted breast, and a thin white eye ring. 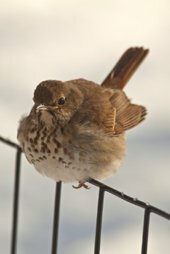 The hermit thrush winters in woodland edges, parks, and gardens, preferring coniferous or mixed woods with undergrowth and ample forest floor. How to encourage a visit: Attract hermit thrushes with evergreen, winter-berry-plants such as holly. Provide low-lying shrubs, logs, and room for open floor foraging. Offer a ground water feeder. 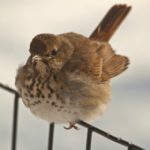 What to enjoy: The lively hermit thrush is characterized by its flickering wings and cocking tail, which sharply raises then slowly lowers when perched. It sings a lovely long flute-like note followed by three to four differently pitched rapid whistles. The Black-eyed junco migrates from Canada and becomes an abundant North Carolina resident from mid October until mid April. A slate gray head, back, and breast, contrasting with the “paint-dipped” appearance of a white underbelly and undertail, identify this popular snowbird. Females are a lighter slate color with hints of brown, especially on the back. 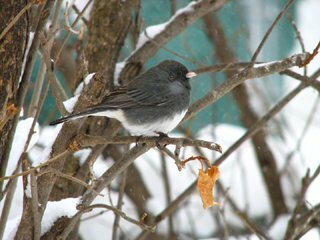 The black-eyed junco likes grassy areas close to woodland shelter, such as wooded trails and thicketed suburban yards. They will frequent backyard feeders. How to encourage a visit: Feed millet or cracked corn in ground or platform feeders near open grassy areas adjacent to woods. Offer low-lying shrubs, native grass, or even a leaf pile as cover. Provide a source of water. 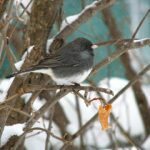 What to enjoy: The black-eyed junco lives in solidarity until winter when they live as part of a small flock. They then feed as part of a rigid hierarchy with dominant males flashing the white “V” of their tails in rapid short flights. 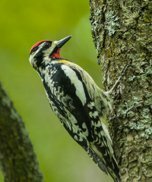 Occupying our woods from fall until mid-to-late April, you can recognize this medium-sized woodpecker by its black and white streaked face, red patch from forehead to crown, white wing patch, and yellow-tinted belly. Males boast a red chin; females white. This species is know for its methodical hole boring, drilling tidy horizontal rows in trees in search of sap, then vertical rows where it will return frequently to drink sap and eat captured insects. While yellow-bellied sapsucker will only breed in dense forest, in the winter they’ll settle into younger or more open stands of trees. How to encourage a visit: With proximity to woods, yellow-bellied sapsuckers will frequent hanging suet feeders. Select a woodpecker suet log, a taller suet feeder, or a cage with a tail prop to accommodate woodpeckers’ preferred perching style. 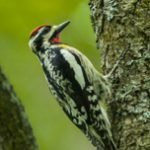 What to enjoy: The yellow-bellied sapsucker is the only true migratory woodpecker in the Eastern United States. With the right menu, you can enjoy the beauty of this seasonal visitor in your very own backyard.